Dr Owusu obtained his BSc (Human Biology) and MB, ChB degrees in 1990 and 1993 respectively at the Kwame Nkrumah University of Science and Technology, Kumasi. He trained in Internal Medicine at the Komfo Anokye Teaching hospital, Kumasi. He obtained the Fellowship of the West African College of Physicians in 2005. Dr Owusu sub-specialized in Cardiology at the Cardiovascular Centre, Onze-Lieve-Vrouw Hospital, Aalst, Belgium from 2005 to 2007. Dr Owusu has been a lecturer at the Department of Medicine, School of Medical Sciences, College of Health Science, Kwame Nkrumah University of Science and Technology, Kumasi, since 2009. He is also an Honorary Consultant Cardiologist and Head of Cardiac Unit, Department of Medicine, Komfo Anokye Teaching Hospital, Kumasi. 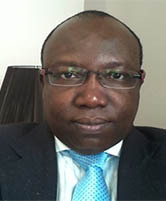 Dr Owusu is an examiner of West African College of Physicians and Ghana College of Physicians.